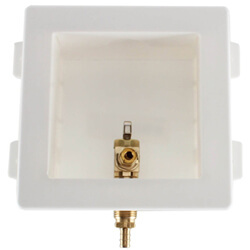 Get safe, speedy, and better looking water supply shut-off access for your washing machines, ice makers, toilets, and dishwashers with these Outlet Boxes. Outlet boxes house supply and drainage lines for various plumbing appliances including: washing machines, ice makers, toilets, and dishwashers. 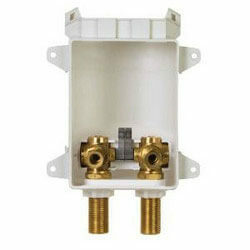 Outlet boxes provide safe and speedy water supply shut-off access. 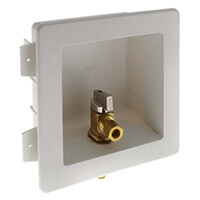 Sioux Chief's Ox Box outlet boxes offer separate supply and drain boxes that allow numerous installation configurations. The over-the-stud installation of the Ox Box allows for supply and drainage lines to be plumbed into separate stud bays, thereby reducing solder joints, installation time, leakage risk, and burned drain pipe. Ox Boxes eliminate the need to source and stock a different box for each application because the Ox Box is able to replace all left-drain, center-drain, right-drain, and dual drain boxes. Ox Boxes are available with frames (standard packs) or without frames (rough in packs). 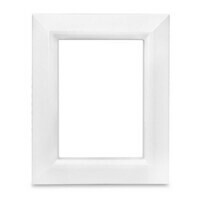 Outlet Box Frames may be purchased separately. 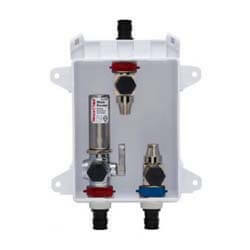 Ox Boxes are also available with or without water hammer arresters. Water hammer arresters prevent damage to pipes by absorbing the shock that occurs when water flow in pipes suddenly stops. 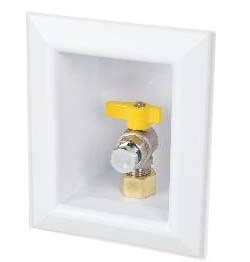 Ox Boxes come in several inlet and outlet sizes and connection types (female sweat, CPVC and PEX). 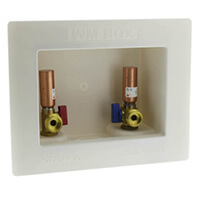 In addition to Sioux Chief outlet boxes, we also offer outlet boxes from Watts and Uponor.